Taulman 3D is a US based 3D printing materials manufacturer known for their large selection of specialty 3D printer filament. They are most renowned for their different nylon types, created specifically with 3D printing applications in mind. Taulman’s Nylon 645 is a co-polymer which is highly appreciated by the entire 3D printing community for its very high strength (be it for individual thread structures or its incredible thread-to-thread bonding), its extreme durability and its excellent bridging performances. 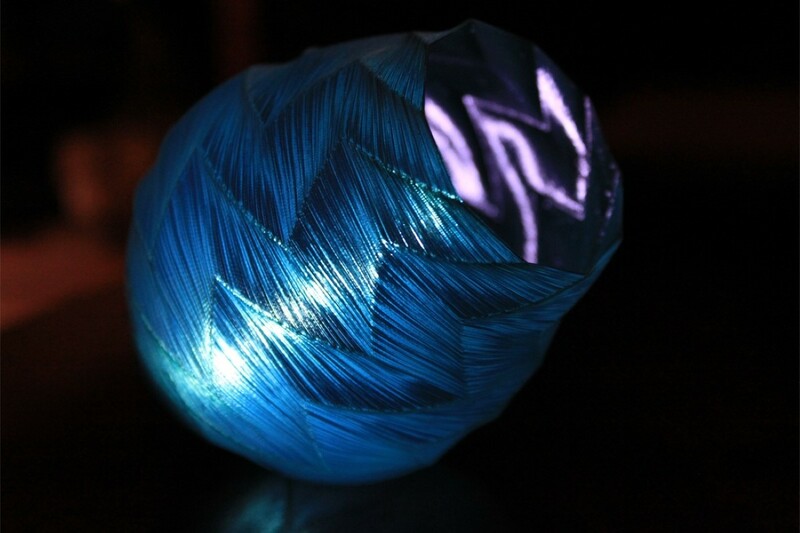 The filament has a high optical clarity and you can achieve transparency/translucency of your printed objects, depending on your layer thickness (see photo in our gallery below). Thanks to this property, Taulman 645 can for example be used to print LED and LCD overlays, though we haven’t tested that yet. But, those are most definitely not the only applications for Taulman 645 nylon. The 645 will produce very strong parts, but which will be lighter than ABS and PLA. The parts will be more or less pliable (depending on infill), but with a slippery surface. Compared to 618, Taulman 645 has better mechanical properties. Especially the materials slippery properties make it interesting for printing gears or ball bearings that require no lubrication or you can make use of threaded holes that won’t delaminate under pressure. Yes, you read right, if you got the right equipment, you can actually cut a usable thread into this material (but we did not try this yet)! On their internet site, Taulman gives detailed instructions for three other main applications of their filament, as it can be used for : (i) casting molds, (ii) medical applications and (iii) CNC milling, drilling and cutting. But before getting those details, let’s first check some of Taulman 645’s general properties as well as some of our findings. Before printing with 645, please make sure that your printer model is able to print with nylon and that it can reach the recommended print temperature. We found that Taulman 645 works best with print temperatures in the range of 240 to 250°C, while the recommended print temp from Taulman is 242°C. Once the 645 is heated up and gets into contact with your hot-end, the 645 nylon may hiss and/or emit fumes. This smoke is nothing else then water/steam evaporating, as Nylon is very hygroscopic, i.e. it will attract and hold water molecules from the air that surrounds it. Actually, nylon will saturate with water (i.e. absorb its maximal capacity in water molecules) in only 18 hours being exposed to ambient air. Although 645 presents a reduced water absorption, the manufacturer nevertheless recommends drying the nylons before use. Also, you should store all of your nylons in the right way when not in use (i.e. an airtight container or sealed plastic bag, together with some silica gel bags) or even better, in a vacuum bag. Taulman 645 has slightly lower shrinkage properties than ABS and the Taulman 618 nylon, and just some rare delamination issues. 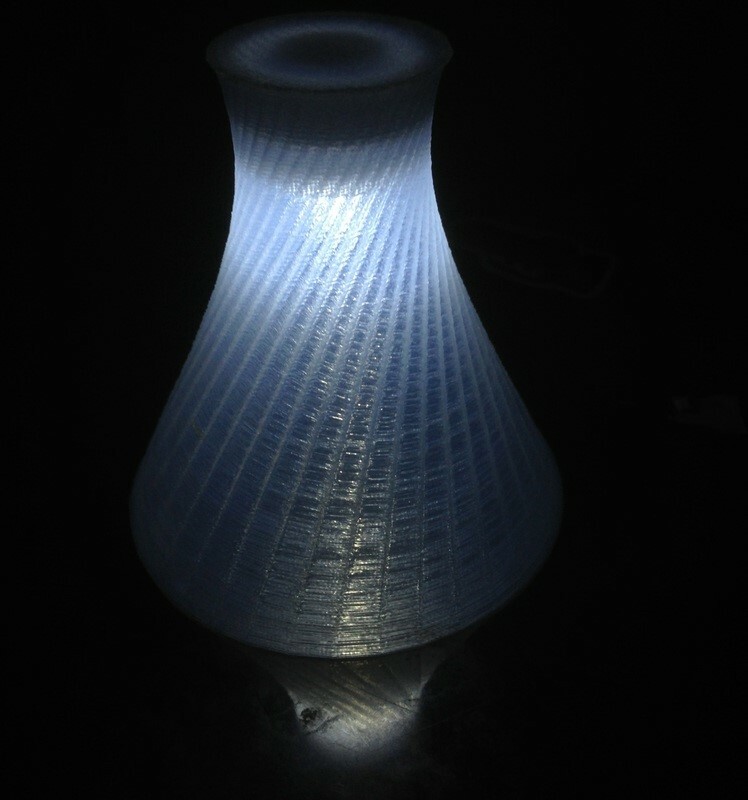 Nevertheless, it can still be a bit challenging to print with and a heated bed is recommended. One of the main problems however is, as with all nylons, to find an efficient way on how to get your first layer sticking to your print bed. 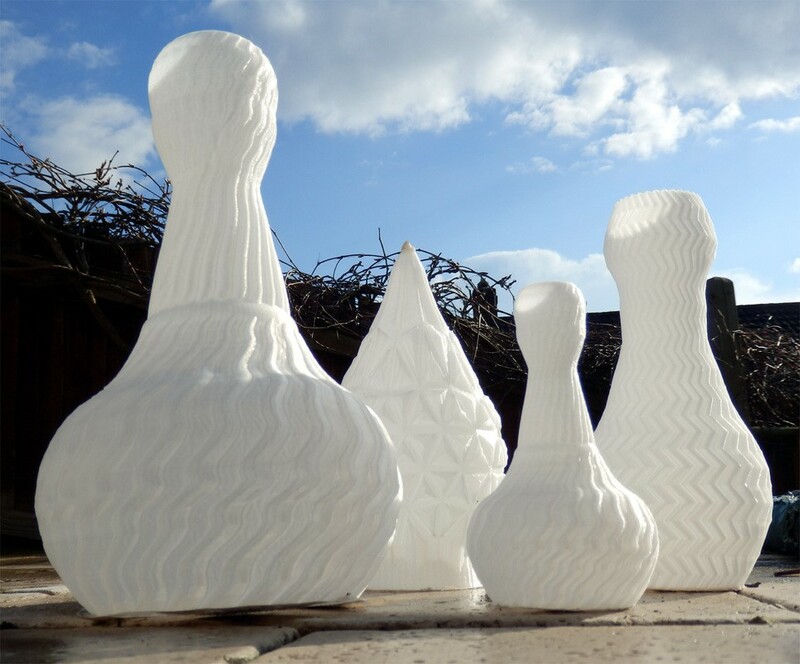 Taulman’s 645 nylon will not stick to glass or aluminium print beds. Taulman actually recommends using a flat piece of unfinished poplar wood, garolite LE or blue painters tape. Garolite (a US brand) is a synthetic resin bonded fabric – its European counterpart is branded Tufnol, as cotton/phenolic resin laminated plastic. Also, be aware that blue painters tape will normally get pulled loose under the stress from the cooling nylon part, even while still printing. We managed to get it to stick to a heated glass plate, using the Elmer glue method, solution which we prefer over all of the above. Alternatively, if available, you can use a nylon sheet as printbed, as nylon sticks very well to nylon. Some users also reported good results with printing onto corrugated cardboard. When it comes to the print resolution, Taulman indicates that 645 is an industrial line and unless a high vertical resolution is requested, you should use 60% of your nozzle diameter as a resolution indicator. So, for our 0.4mm nozzle on our Ultimaker Original, we should print with 0.24mm resolution. According to Taulman, you should not have any nozzle clogging/fouling problems, even if you leave 645 for over 8 hours in a heated state in the hot-end. They just recommend purging about 50mm of filament after changing the material. Print speed will naturally depend on the nature of the piece your are printing. One should just take into account Taulman 645’s higher viscosity and apply the following rule: if your layer resolution exceeds 50% of your nozzle diameter, you should reduce your (standard) print speed between 10-20%. As an example, on our Ultimaker Original, if we print with a resolution of less than 0.2mm (the nozzle has .4mm), you should reduce your print speed of 50mm/sec to 45-40mm/sec. A few supplementary recommendations when you are using Taulman 645: (i) do not heat it over 340°C, as it will begin to thermally degrade (pyrolysis) at those temperatures, (ii) use a printbed temp of 30-65°C, (iii) an ambient temp of 30-100°C (heat chamber or closed printer if possible) and (iv) augment your retraction values to an additional 2-3mm (this may help to compensate retraction problems on a very slippery filament). Although nylon is generally quite resistant to chemical degradation, you should note that strong acids can break the bonding of threads, resulting in a weakened print and that water-based solvents will discolor permanently your printed parts. Also, gluing parts is near to impossible – just use a soldering iron for melting parts together. For those interested in this great filaments exact specifications, Taulman publishes a list for each of their products. The spec list for Taulman 645 is available here. As for the previously mentioned applications of the filament, it seems that Taulman 645 is particularly suited for the creation of casting molds from 2 part epoxies, MEK (Methyl Ethyl Ketone, a.k.a. Butanone – a special solvent also used to weld some plastics) activated resins and UV activated resins. Taulman recommends using 645’s viscosity to the advantage of the mold designers, especially for those using silicon based molding compounds. Very often, 3D printed parts are not capable of holding liquids, due to micro-crevices, bad extrusion, temperature changes, material impurities or faulty thread-to-thread bonding during printing. Due to its inherent properties, silicon will leak from the mold if there is even the slightest gap in its wall structure. Therefore, Taulman recommends augmenting the flow ratio, in order to extrude more material then necessary “even to the point of creating ridges and overlaps”, as these will eliminate all the potential gaps in the mold. They even recommend using a domed hot-end, instead of a flat tip one, as the domed tip will press the extruded material into crevices, as well as flow over to adjacent threads, thus resulting in a water tight mold ready for a pour. Skirt = minimum of 4 (due to 645’s viscosity, it will take longer to equalize first layer pressure in the nozzle than ABS). Perimeters = minimum of 2. We have not yet used the 645 for mold making, but if you have some experience in that domain, please feel free to share your experiences and insights with us. 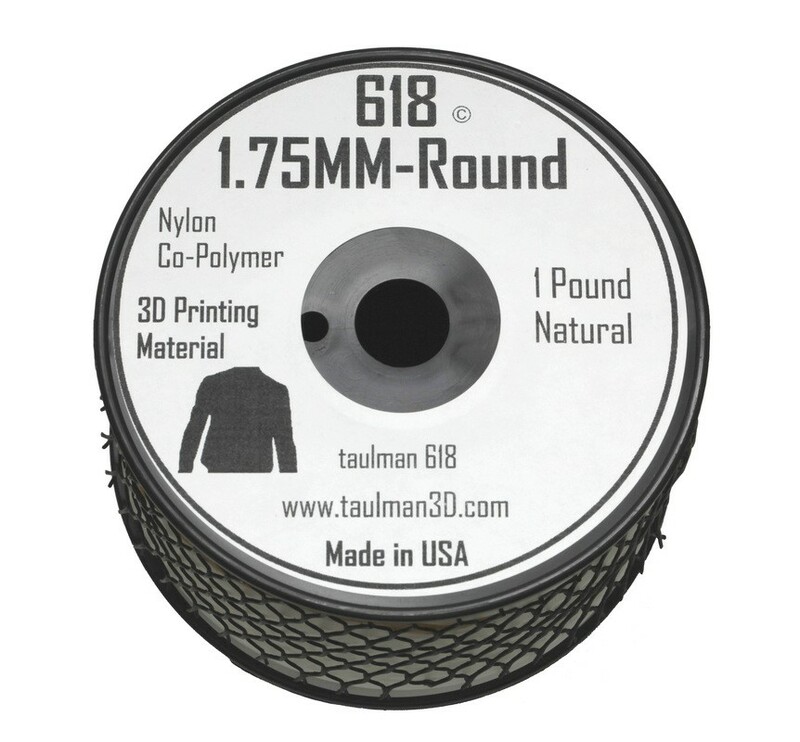 Taulman Nylon 618 is the one nylon co-polymer for 3D printing, which has been on the market the longest. After thorough testing, it was officially released on 12/12/2012 and was immediately and widely accepted by the 3D printing community which was looking for such a high strength, non-delaminating filament. 618 has almost most of the aforementioned 645’s properties, being pliable, light-weight, chemically resistant, with high thread-to-thread bonding, etc. The 645 type however has even more tensile strenght and better thread-to-thread bonding than the Taulman 618. As with 645, you can cut threads into 618 nylon, which do not delaminate under thread pressure. It is resistant to chemical degradation and can be used, as the 645, for casting molds. Both the 645 and 618 are odor-neutral. 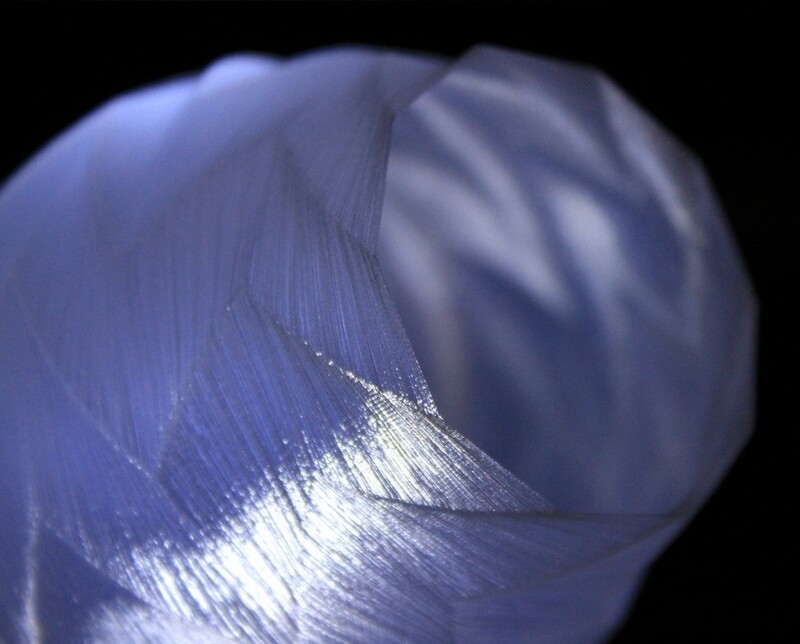 Contrary to Taulman’s 645 nylon, the 618 is not transparent or translucent, but whitish opaque. It is only available in this “natural” (i.e. zero color) color. Although it may be considered “slippery”, its mechanical properties are less evolved then those of the 645 type. 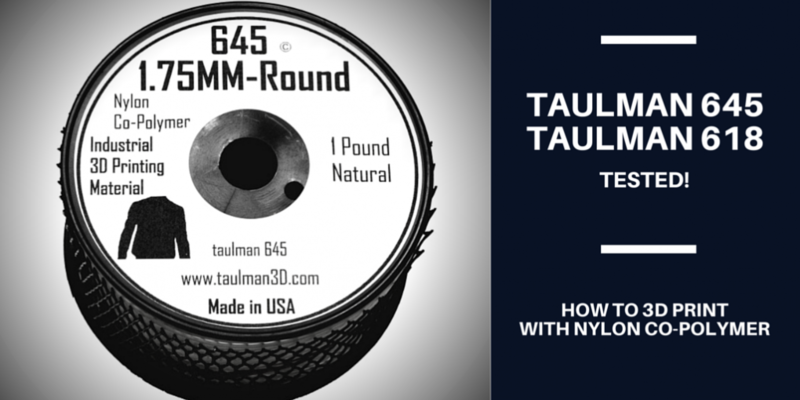 Comparing Taulman 645 vs 618 in that specific domain, the 645 will remain your candidate of choice if you are planning on printing ball bearings, gears or other mechanical parts. Another specific property of the Taulman 618 nylon is that you can color it with nylon-compatible dyes. The best guide written to color your 618 is by the ingenious RichRap whose blog we do actually highly recommend reading/following. His specific blog post on dyeing Taulman 618, which is probably the most complete and best researched article on dyeing 3D printer nylon on the net, can be found here. According to our testing of Taulman 618, we determined that it prints best at temperatures around 240 – 255°C, while the recommended print temp by Taulman is 245°C. The specific temperature ranges and specifications can be found on the Taulman 618’s specification page. Do consider adding at least 4 skirts (due to its viscosity, the Taulman 618 nylon will take longer to equalize the first layer pressure in the nozzle) and lower your speed for great results. The 618 is more prone to shrinkage then the 645, so the use of a heated bed is recommended. When it comes to heated bed properties and settings, print resolution, print speed, fumes, retraction values and other recommendations, please refer to the Taulman 645 section above, as they are identical for both types of nylon. 3D printed objects in Taulman 618 Nylon are very close to injection molded equivalents when it comes to strength, as they are really tough, far more than parts printed in ABS. ABS is more brittle and will shatter, or at least break when hit with a hammer – the nylon will only make it bounce (granted, this reaction also depends on the geometry of your part). However, compression and breaking tests of 100% infill solid objects do confirm this property. Taking into account all of the above properties, we came to the conclusion that both the Taulman 645 and 618 are amongst the best filaments you can use for printing really strong, resistant 3D parts. Do you have any interesting parts printed in the above mentioned 3D printing materials which you would like to publish? Or maybe based on your experience you have some specific recommendations for working with these materials that you would like to share? Let us know by leaving a comment below. I am interested about your new nylon filaments. Are there 3 mm filaments available? Next question seems to be hard for anybody to know answer (I tried different companies): I am going to fit second extruder for Ultimaker Original for using two different colours. I am using Cubify Design software for design. There are several slicing software to support two colours, but none design software. I tried to learn Blender, which will answer the need, but Blender seemed very difficult for me to learn. I have Solidworks 2004, but that has no fuction for two colours. Do you know any software to support that fuction? 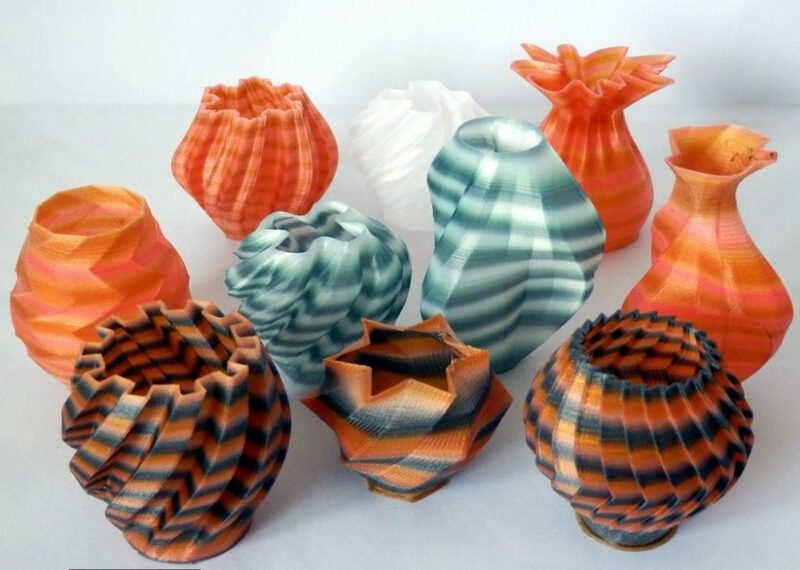 As for the dual extrusion question, you should know right from the beginning that dualstrusion prints from you own CAD files is quite a complex process. As I have not worked with Cubify Design yet, I cannot tell you of this software is the right choice for what you want to achieve. I also do not know what your knowledge level in 3D printing is, but you need to be aware that what you are planning is not something easy. For instance, are you fine by fixing your .stl files manually after exporting them from the CAD program, i.e. change the gcode manually where necessary? Before starting designing your own CAD files for dual extrusion, I would recommend that you play a bit around with dualstrusion samples first. Achieving good prints with dualtrusion can prove difficult and samples will help you understanding the machine, the limitations for dualstrusion and the techniques you will need to understand to achieve god prints. Some of the more complex CAD softwares may have a proper dual extrusion feature, but most of those come with quite a steep learning curve. You correctly cited Blender and I think Rhino supports this too. But I have not yet played around with this yet, neither on the printer side, nor on the software one. As far as theorie goes, I understand that you simply design your parts keeping in mind that they will be printed in dual extrusion. The pieces are designed in such a way that the “two colored parts” you are looking to achieve are drawn/created separately from each other and later on “joined” together into one final piece. Alternatively, you design two separate pieces, import them both into your slicer and tweak that one, so that it will print the two pieces together as one. As you are using an Ultimaker Original, I would advise you to join the Ultimaker forum (http://umforum.ultimaker.com/) where you will be able to meet people which have already tackled those problems. The community here is great, very helpful, extremely knowledgeable and friendly, whatever your own knowledge level is. Those guys and gals will be able to help you far more specifically then me, as I have not yet played around with dualstrusion either. i was wondering if taulman/nylon requires any modification to the extruder or if it can print as is. i have a lulzbot taz4 with a hobbed bolt and i think Tmax for the nozzle is 240ish, I guess the problem would be Tmax…. I was asking because i know with ninbja fkex you need a spedical bolt/frrder setup to deal with the ‘squishy’ness. Thanks for stopping by. Could you please specify what type of nylon you are talking about? Taulman sells a lot of different filament types and their extrusion temps do vary. If you refer to the extrusion temps for Taulman 618 or 645 from the article, we recommend extrusion temps of 250°C and 245°C respectively, as they worked well for us. I would recommend that you check your Tmax on your Taz4. Unfortunately, I did not work with that specific machine yet, so I cannot tell you what the correct tmax values are. Also, there seem to be some models with different extruder types, so you need to check on your specific hardware. I would recommend that you contact people at the excellent Lulzbot forum: https://forum.lulzbot.com/ People are very knowledgeable and helpful there. Once you specify them what your hardware is, they will be able to assist you. Tmax 240°C does seem a little on the low side, normally Tmax is around 250°C – 260°C, depending on your machine. If your machine only goes up to 240°C, i would not recommend printing with nylon, as you may melt the filament enough to get into the hot end, but not liquid enough to extrude through the nozzle. That will leave you with a big mess, as you may clog up your heat chamber, but won’t be able to get the clog out. And you may end up having to replace the whole hot-end. As for NinjaFlex, the requirement of a special bolt to deal with its inherent “bendiness” is normal. You have the same problem on other machines. But I do not see how that is an issue in case of nylon, as nylon may be a bit flexible, but it is no TPU (Thermoplastic polyurethane, i.e. the bendy stuff NinjaFlex is made out of). Your Taz4 should have no problems getting the filament into the hot-end, but but the temp issue remains to be solved. Also, it is sometime possible to go and change the machine settings regarding Tmax (i.e. a software limitation of 240°C can be removed). But you should know that doing so may remove your warranty and can pose a security risk. Only do so at your own risk. People at the Lulzbot forum may be able to help you a bit more on that regard too. what is the smell of taulman 618? Not sure whether I understand your question correctly. Do you want to know what nylon is manufactured out of? 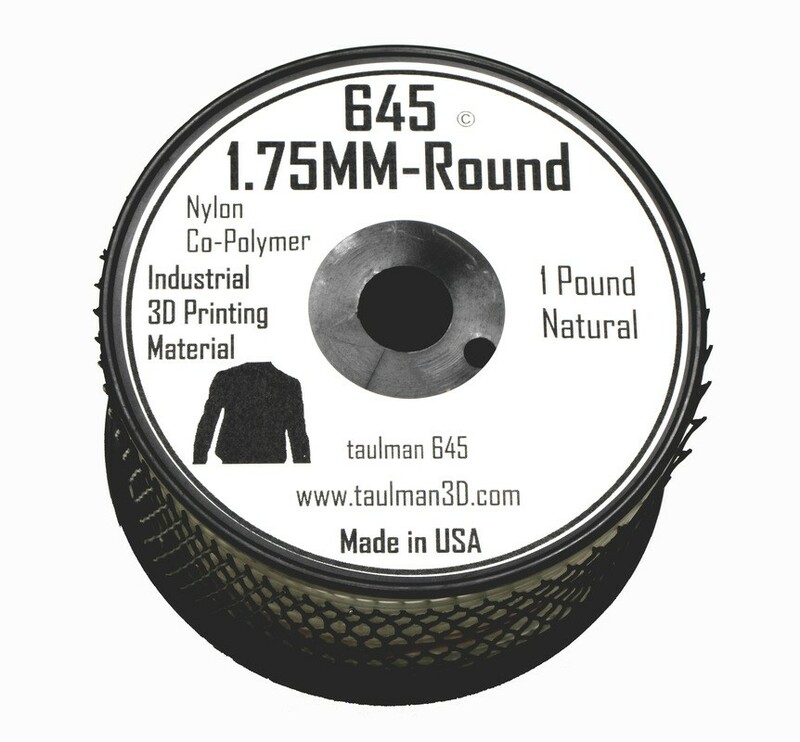 As indicated in the article, Taulman 618 filament is a nylon co-polymer. If you want to find out more about nylon (i.e. synthetic polymers) in general, do check out the Wikipedia article on Nylon. As to smell, Nylon may develop puffs of white smoke coming from evaporating water (check the nylon hygroscopic tendencies part of the article), but it does not really smell. Compared to ABS, there is close to no smell while printing with nylon. But please do consider that some people may be more sensitive than others when it comes to smells.